Unfortunately, the gorgeous colours are now mainly gone, effaced by the forocious sun of sub-tropical Egypt. But in the times of David Roberts (1796-1864) - the famous Irish painter who visited Egypt in 1838-9 drawing its many marvel - they were still alive, as can be seen in Fig. 1(e) and 1(f) which we owe to the great artist. 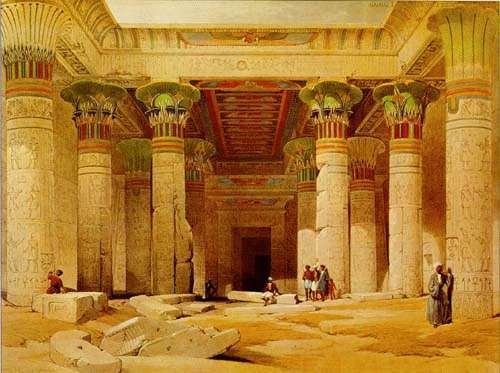 Space does not allow a fuller presentation of the many beautiful drawings that Roberts bequeathed us and which portray the interior of the Egyptian temples. The ones of Fig. 1(e) and 1(f) show, the interior of the temple of Isis, in the island of Philae. On the pillars of Isis' temple of Philae can be seen several christian crosses. These were carved in the VI century, when Bishop Theodorus transformed the temple into a Coptic church. Very little transformation was indeed required, the "Christianization" consistingof the carving of the crosses and the construction of na altar for the celebration of Mass. In fact, one of the key factors of the instant sucess of Christianism and elsewhere was the sunchretism of isis with the Virgin Mary and that of Osiris (Serapis) and Horus with the somewhat equivocal figures of Christ and his mysterious Father. In fact the Immaculate Conception was taken verbatim from the identical one of Horus by the dead body os Osiris. After the great god had been murdered by Seth, his evil brother, Isis sought out his dead remains, which she gathered and mummified, with the exception of the phallus, which could not be found. In her temple at Dendera, Isis is shown under the guise of a bird, beating her wings to insuffate life into Osiris' body, while magically conceiving her Son Horus in the process. It is precisely this ancient conception that is meant in the Book of Revelation where it alludes to the fall or descent of the New Jerusalem from above, and adds that "there will be a new earth and a new heaven".